Heating and Cooling Repair Jackson WI | Qualified. Dependable. Honest. Furnace and Air Conditioning Repair - Qualified. Dependable. Honest. 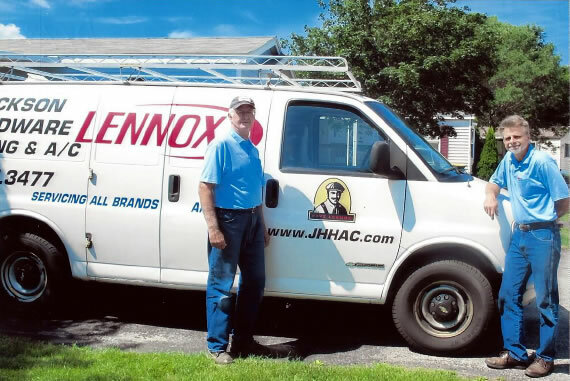 For over 27 years, Jackson Hardware Heating & Air Conditioning has provided furnace repair, air conditioning repair and HVAC services to residents throughout Washington and Ozaukee County. We service all makes and models of heating and cooling products for residential customers. Customer Satisfaction: In 2015, 55% of our new customer service calls came from referrals. Professional Technicians: Our technicians are factory trained, uniformed and experienced in heating and cooling repairs. If your equipment is acting up, it’s best to have it serviced so the equipment doesn’t fail in the middle of the night. With no gimmicks or costly flat rate charges, contact us today to see why just last year, 55% of our new customer service calls came from referrals. Contact us online through the form below or call our office at (262) 677-3477. We offer free diagnostics over the phone and even provide repair advice for the “do it yourselfer”! When you work with Jackson Hardware Heating & Air Conditioning, one of our highly trained, uniformed techs will meet with you in your home and evaluate the problem you are experiencing with your furnace or air conditioning unit. They’ll explain in simple terms what needs to be fixed. Our technicians keep you informed throughout the entire duration of the repair. At Jackson Hardware Heating & Air Conditioning, there’s no need to worry about a mess, because we are respectful of your home and often leave an area cleaner than we found it. Contact us and let us know how we can help with your HVAC repair needs.